Are you looking for a walk in 3 bedroom condo in Branson? Ours was totally remodeled in 2016! It is located at The Champions at Thousand Hills. The condo has three king beds and a queen size sofa sleeper. The condo is located just four blocks off of highway 76 behind The Grand Palace theater. The condo is less than 2 miles from Ballpark of America! The Champions condo complex has an outdoor swimming pool, tennis court, and small playground available to our guests. 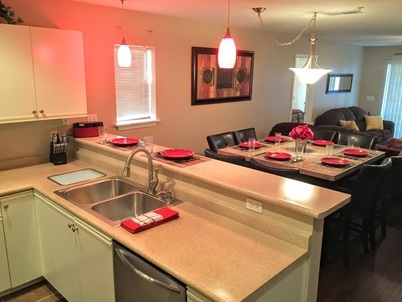 This condo has central heat & air to keep you comfortable during your stay. See pictures and more information below. We also have four 2 bedroom condos in Branson across the golf course. Just 1/2 mile by car. No deposit is required. If you decide to reserve a condo we will email you a confirmation. We do collect full payment two weeks prior to your stay. You may pay with a MasterCard, VISA, PayPal, or mail a check. Once paid, we would email you your door code, directions, and condo information. We use a keyless lock on the door so you would not have to check in anywhere, just go directly to the condo and use your door code.